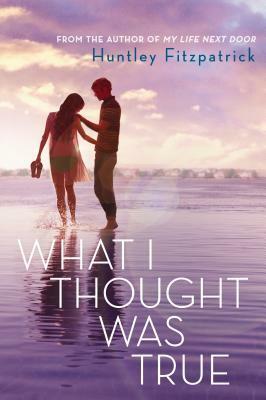 From the acclaimed author of My Life Next Door comes a swoony summertime romance full of expectation and regret, humor and hard questions. Gwen Castle has never so badly wanted to say good-bye to her island home till now: the summer her Biggest Mistake Ever, Cassidy Somers, takes a job there as the local yard boy. He's a rich kid from across the bridge in Stony Bay, and she hails from a family of fishermen and housecleaners who keep the island's summer people happy. Gwen worries a life of cleaning houses will be her fate too, but just when it looks like she'll never escape her past—or the island—Gwen's dad gives her some shocking advice. Sparks fly and secret histories unspool as Gwen spends a gorgeous, restless summer struggling to resolve what she thought was true—about the place she lives, the people she loves, and even herself—with what really is. I was a little bit hesitant going into this because there has been so much high praise around Huntley Fitzpatrick. More specifically she is often compared to Sarah Dessen (my all time favorite author). Whenever people are compared to Sarah Dessen I have too many high expectations and the book ends up falling flat for me. BUT this was not the case for What I Thought Was True! Huntley Fitzpatrick is definitely one of the next star contemporary YA authors! What I Thought Was True exceeded my expectations. One of my problems in contemporary today is that the storylines are becoming too dramatic and not realistic. Fitzpatrick does a fantastic job creating a story that can happen in any high school. The main plotline and the sub plots were all realistic, relatable, and fully scripted. I love this type of book because I can see the story happening in my town and to me and my friends but I also know that this same plot is unraveling for a girl in a town half way across the country from me. Things like money troubles, betrayal, confusing romance, complicated family and friendships are what every girl can experience in high school. I know readers will be able to connect with these plot lines and characters. The Characters were phenomenal. The protagonist, Gwen, was very teen authentic in the way she thinks, acts, and handles herself. Gwen will be able to speak to all high school girls out there. You will be able to see a part of yourself in Gwen and that is one of the reasons I liked her. I feel like there is a part of her in every teenage girl. The supporting characters were all very well planned out and created too. Cass, Gwen's love interest, is extremely likable. He is down to earth, persistent, confident but shy, and trying to figure out his place in the world. He was very believable and the perfect match for Gwen. I also loved the supporting characters, of Gwen's family and friends. They each had their own background making the story feel complete and real. Gwen and Cass' romance was no doubt rocky. They had their ups and downs. It was a roller-coaster and had a lot of back and forth. But that was why it was perfect. There was no insta-love. You got to see them learn about each other, accept themselves, and learn to build a stable relationship. They were nowhere near perfect at the beginning and I loved that. They are both dealing with things in their own lives and they end up hurting and pushing each other away. But they both grow up throughout the summer and you get to watch them find themselves and find each other. I also really enjoyed the pacing of the book. It was a little bit slower but this is the kind of read where I always think that's supposed to happen. You get to see people grow and evolve over the summer. You fully see the storylines happen form start to finish. And of course you get to watch Cass and Gwen fall in love under the summer sun. One thing I do think is important in contemporary today and that Fitzpatrick executed wonderfully, is a balance between romance/relationships and independently finding yourself. A majority of the book is the love story of Gwen and Cass but you do also get to see Gwen struggle in her responsibilities and things at home. You get to see her fix things on her own and see her grown into a young woman. What I Thought Was True is a breath of fresh air in YA contemporary today. If you are looking for a book to send you back into the love filled summer atmosphere as these cold months approach do pick up this book.